This little freebie pack is a small way for me to say a giant Thank You for your endless kindness and support of my little TpT shop! 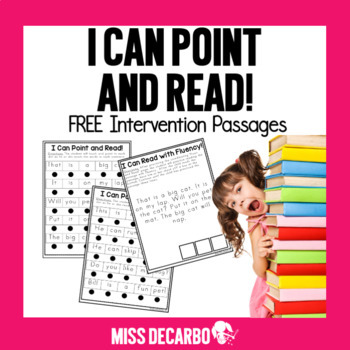 Included in this download are five "point and read" intervention passages for your beginning or struggling readers. There are two pages per passage. They can be copied back to back or placed in a binder with sheet protectors. The student will first point and read the words within each sentence. Then, the student will read those same sentences within a "passage" format three times for fluency. This pack will only be edited in the event of an error by the author. It is not eligible for edits, custom requests, additions, or as an editable file. Thank you so much for your understanding!